So far in 2015, 88% of cycling-related fatalities in London have involved a HGV, a rise on a previous five-year average of 53%. HGVs are a particular concern for cyclists, because their large size means blind spots are hard to monitor. A new project aims to provide a solution. 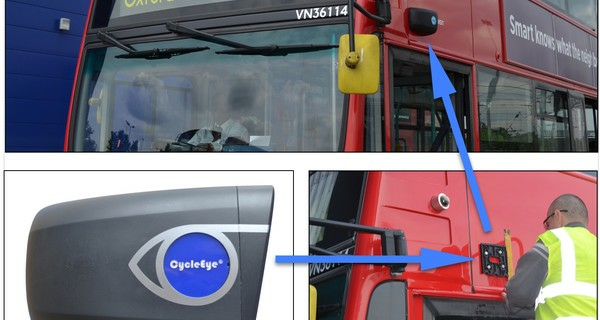 Created at the University of Bristol’s innovation centre, CycleEye® by Fusion Processing Ltd is a sensor system that can be attached to buses and lorries to alert the HGV driver to the presence of a cyclist. The alarm sits in the driver’s cab, and CycleEye® is programmed to identify bicycles in potentially dangerous zones around the vehicle. The technology behind CycleEye® is a system of radar and cameras that identifies cyclists while ignoring other objects such as bollards, railings and the like. The audible warnings allow the driver to react quickly to alerts such as “Cyclist left”, reducing risk to the cyclist and other road users in busy urban environments. Initial testing has proven extremely positive – in a three-day trial with TfL, CycleEye® had a 98.5% success rate at identifying cyclists. Following another more local trial, Bristol City Council has raised funding from the Local Sustainable Transport Fund to allow CycleEye® kits to be installed on a number of city buses in 2015. The team behind CycleEye® and Fusion Processing has further plans – they intend to continue developing advanced sensor and processing technologies for the intelligent transport systems in future. In the meantime, they’re actively looking to introduce CycleEye® to more fleets and cities – an initiative that cyclists and other road users can all get (safely) behind.